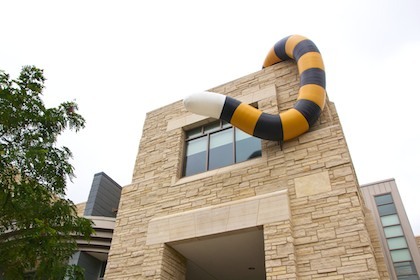 "We asked Landmark to come up with something that would make it look like a tiger had fallen asleep on the roof of the student center and its tail was hanging off the side." That'll get your attention! Truman, the school's tiger mascot, had his tail reproduced in traditional Mizzou gold and black. The 20-foot-long inflatable character can be easily mounted and removed without damage to the roof. This gives MU the freedom to grab a tiger by the tail during back-to-school events, football weekends, special sales at the Mizzou store and other occasions. Why Landmark? "Landmark created two inflatable Truman the Tigers for us, and they were incredibly easy to work with, as well as very affordable." Looking to make an impact at your University? Browse our online galleries!